Inverters R Us carries 12 volt pure sine wave power inverters (PSW) manufactured by Aims, COTEK, Go Power, KISAE, Magnum Energy, Outback, Power Bright, Samlex America, Thor, Wagan, and Xantrex. Pure sine inverters are great for medical equipment, digital music amplifiers, higher end televisions, and essential for microwaves and laser printers. 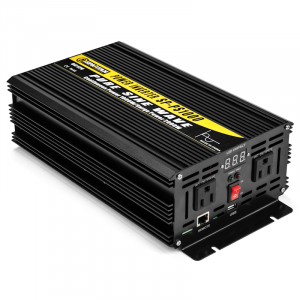 These 12V pure sine power inverters are listed numerically from smallest to largest and each 12V PSW inverter differs in size, features and specifications. Can’t find a 12 volt inverter that you are looking for? Give us a call today at 866-419-2616 M-F 8AM-4PM PST and we can source it for you!